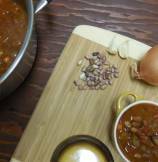 This is fall soup series and today I am sharing with you Pebble Beans and Roasted Tomato soup. This vegetarian soup gets meaty nutty taste from pebble beans and smoky flavor from roasted tomatoes. 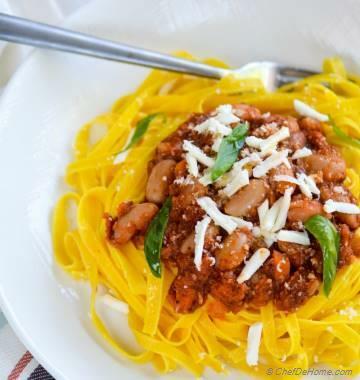 Pair this soup with crusty Italian bread for dipping and you are set. 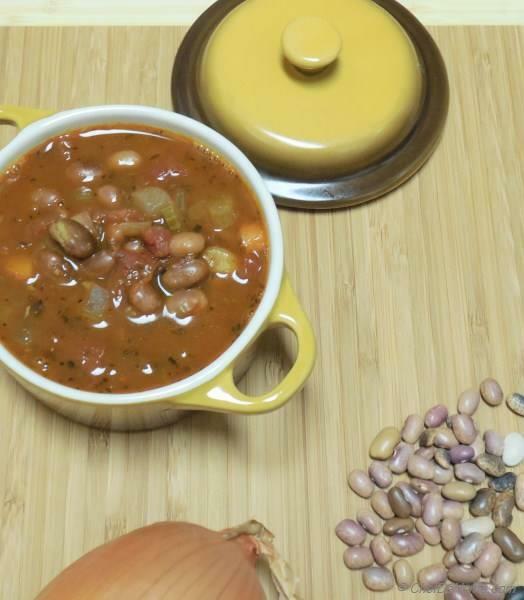 This soup was a nice change of taste from our old red kidney beans soup. I had full intentions to freeze a portion of soup for weekday but we ended up repeating it for dinner the same night. Pebble beans have slight firm skins and meaty pulps (even after fully cooked), so they work very well in low-slow cooked soups and stews. However, to save time you can boil pebble beans with two cups of water while you sauteing aromatics. 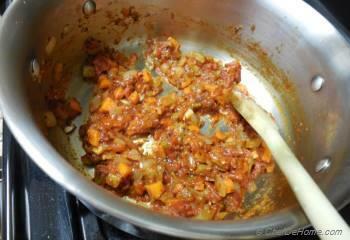 Once aromatic are almost cooked, add vegetable stock, par-cooked beans and cook for additional 10 minutes. This cuts the time to two-third. So this was the second method (faster) to make pebble beans soup. And first method is described below which is little longer. Or if you have no time to make the soup, just follow the below direction and add all mixed ingredients in a slow cooker and let it cook low and slow for 7-8 hours. 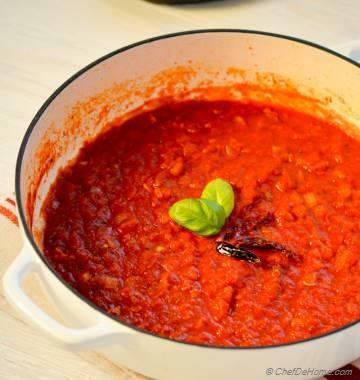 No matter which method you opt, meaty texture of pebble beans with smoky roasted tomato, fragrant thyme and cumin make this soup a must have. 2. 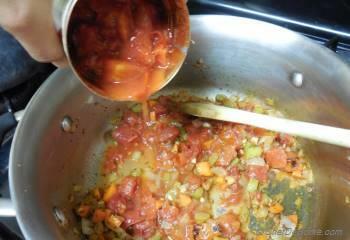 Add roasted tomatoes, chopped garlic, salt and continue cooking. 4. 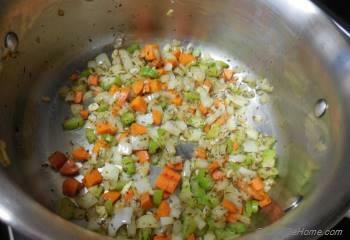 Add 2 cups water, 2 cups vegetable stock, pebble beans and bring to boil. Lower the heat and simmer for 15-25 minutes till beans are tender. 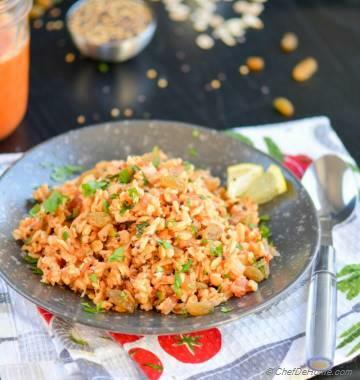 Remove from heat and serve hot with a rustic bread on the side. Skin of pebble beans don't get soft like black or red kidney beans, generally inside is tender and skin is slightly firm in texture. Did I mention that all soups I make are low-sodium and low-fat? I only use homemade vegetable or chicken stock (no-salt added) for most of soups. This way I can control the amount of fat and sodium my winter soups have. 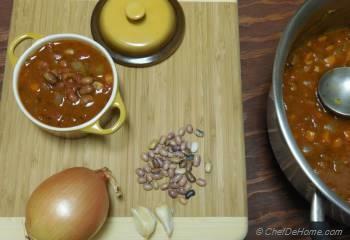 In-fact, all beans based soup don't require roux since beans add their on richness and creaminess to soups. So make any soup from my soup series and enjoy a healthy bowl of soup without load of calories. I tried you pebble beans soup yesterday but replaced vegetarian stock with chicken stock. You were right, beans skin never got soft like red beans but it was super delicious. excellent soup recipes ChefDeHome and very good photos. @Nishu, I found pebble beans in farmer's market. I am sure most store have'em during fall-winter season for soups and stews. Check it out. Thanks for stopping by. I never heard about Pebble Beans before? Are these easily available?